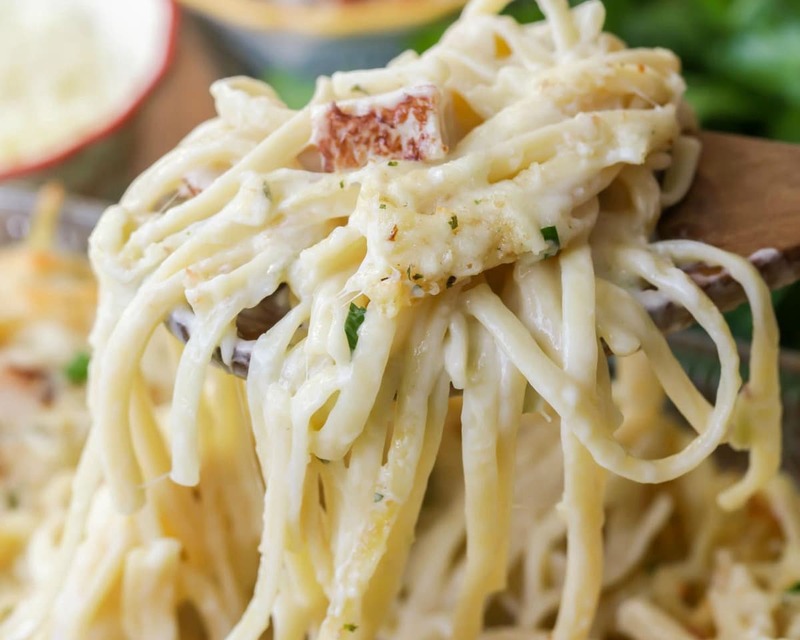 This creamy Turkey Tetrazzini is a simple and flavorful pasta casserole dish. It’s perfect for using leftover holiday turkey, but makes for a crowd favorite year round! Thanksgiving is almost here and if you’re anything like me, you’re BEYOND excited to gather with friends and family and eat delicious food. We gather with the entire Luna gang for hanging out and feeding our faces, but there’s always one problem. We make WAY too much food!! One item we always have leftovers of is the turkey, so today I wanted to share a delicious and simple recipe for all that leftover meat—because let’s be honest, you can only eat so many turkey sandwiches. We have been long-time fans of Tetrazzini (mostly because it’s SO easy), but we’ve always made it with chicken. I wanted to modify this classic recipe to use turkey, and I’m so glad I did. The result was amazing and the hubby declared it tasted better than our classic version. This recipe really is so simple and doesn’t take long to prep and make. I began by combining the butter, sour cream, cream of celery, chicken broth, salt and pepper in a medium bowl to create my cream mixture. From there I added the turkey chunks and cooked linguine. Once this is all combined, I poured it into a greased casserole dish. From there, I topped the dish off with some grated Parmesan cheese, Mozzarella cheese as well as some bread crumbs. 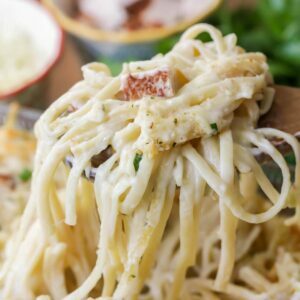 The cheeses and crumbs added so much flavor and create the perfect tetrazzini along with the creamy turkey linguine base. Then I just baked it in the oven for 35-40 minutes until the cheese was nice and bubbly, and voila! The end product: a casserole dish full of creamy, wonderful comfort food. 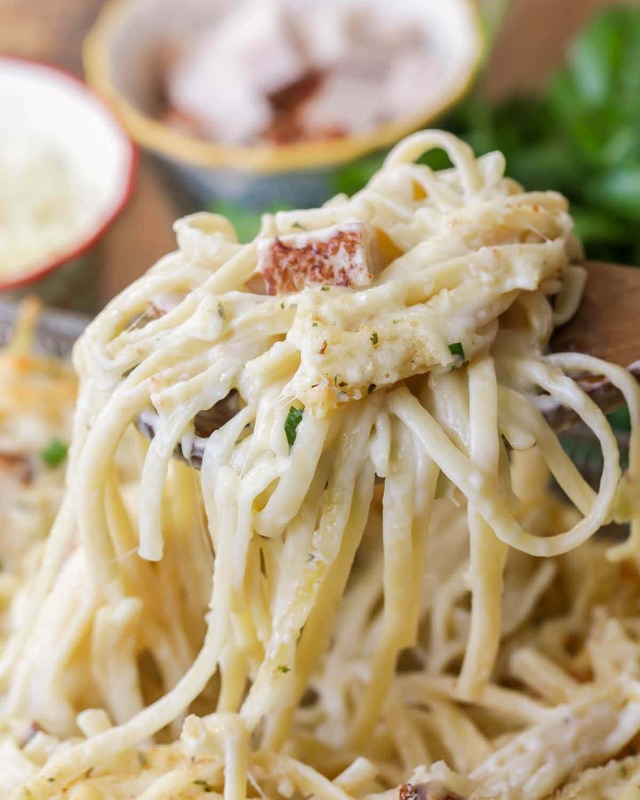 Switch the linguine noodles for spaghetti or egg noodles. Still use 16 ounces of noodles, and follow the normal cooking instructions. Add sautéed mushrooms before stirring in the noodles. Add frozen peas when you combine the noodles and sauce mixture. Use cream of mushroom soup instead of cream of celery. 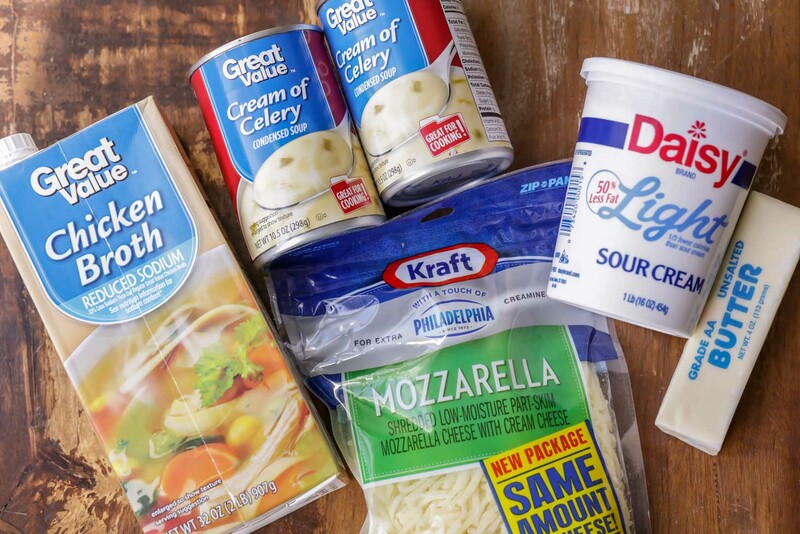 Can turkey tetrazzini be frozen?Like most other cream-based casseroles, you can freeze tetrazzini after baking. Make sure it is completely cooled before covering it with heavy duty foil and putting it in the freezer. To reheat, take it out of the freezer and let it thaw in the fridge for 24 hours before you plan to bake it. Bake, uncovered, at 350° for 35 minutes or so, until there are bubbling edges and you can tell it is heated through. 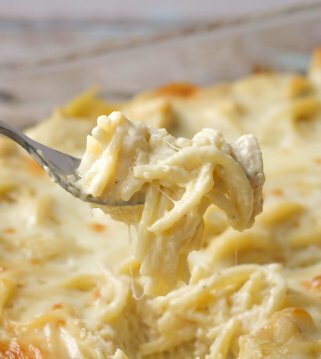 If you didn’t have time to thaw your tetrazzini casserole in the fridge, you can still bake it frozen. Make sure you leave it covered with tinfoil, and add an extra 45 minutes or so to the time. Uncover for the last 15 minutes of baking. HOLIDAY TIP: Use leftover turkey in recipes by chopping it up, bagging it and freezing to use in this recipe for later! 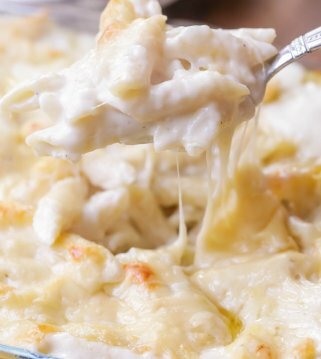 This creamy Turkey Tetrazzini is a simple and flavorful pasta casserole dish. 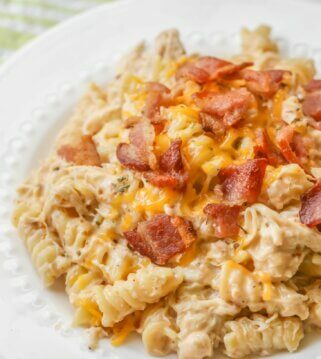 It's perfect for using leftover holiday turkey, but makes for a crowd favorite year round! 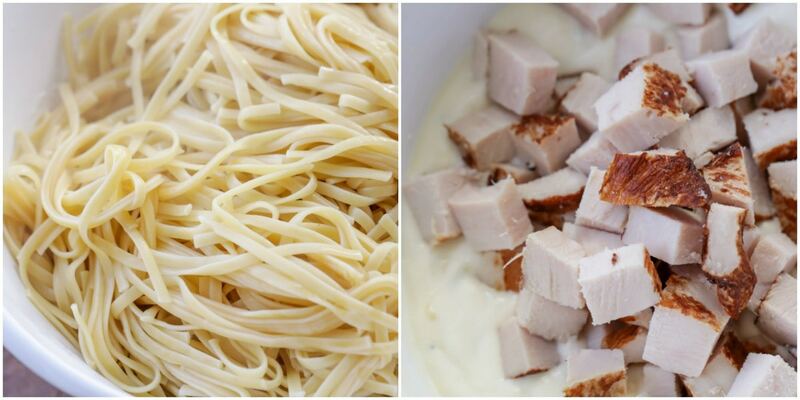 While noodles are cooking, combine butter, soup, sour cream, salt, pepper and chicken broth in a medium bowl. Mix well and add turkey chunks. Stir in noodles until well combined. 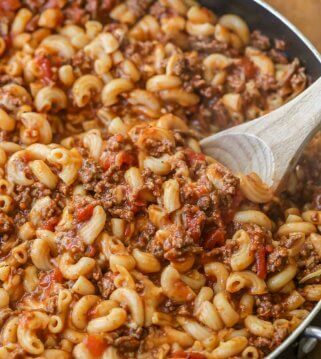 Spray a 9x13 pan and pour in noodle mixture. Sprinkle cheeses on top along with bread crumbs. Bake for 35-40 minutes. ENJOY! We LOVED this Turkey Tetrazzini. It was so easy to make and is perfect for any leftover turkey you may have after a holiday. Thanks! I agree!! I am so glad you loved it! Thank you! My kids and I really liked this recipe. I Baked it in an 11×15 pan to make sure it wouLd fit and used one can of the family sized cream of celery souP i think it is 26 ounces for a liTtle extra sauce. It was a yummy casserole my teenage boys and smaller kids enjoyed. My husband tolerated it, but he doesn’t really like pasta casseroles. That’s good to hear!! Thank you for trying it!! A follow up for you… my husband was eating the turkey tetrazinni leftovers last werk and he said it was really good. I told him i though he didn’t care for it. He said he liked it, but it wasn’t tacos which are really good, haha. Tacos are the gold standarD. Thanks again for a tasty recipe. LOL!! Thank you for letting me know! I made this low sodium by making my own cream of chicken soup. I added a cUp of chopped celery, 1-2 cup sliced MUSHROOMS And a 1-2 cup of frozen peas, thawed. this was the best turkey tetrazzini both my husband and I have ever eaten!!!! Sounds perfect!! Thank you for sharing that! I will have to try! Hope you like it!! Thank you!